Slowly, the recession and crisis are starting to become clearer. Here I’ll jot down some thoughts. 1. Why have I thought that Keynesianism had any chance of being correct? I can’t think of good theoretical foundations and there isn’t good empirical evidence. Sticky wages and prices really isn’t enough. There isn’t a simple model of the kind that I always require in microeconomics, or a simple story. But since I haven’t thought about it hard for 20 years, maybe I should now, since I have learned a lot about modelling and about the economy. 2. I’m coming to think there wouldn’t have been much of a recession except for changed expectations around October 2008. Part of the financial sector was in desperate shape, but it looks to me as if all the investment banks and big banks were in desperate shape, plus some speculative banks and companies like GM and GE, but no small banks outside of Nevada and such places. I’ve come to doubt even TARP I. Was it just that Secy. Paulsen thought that if New York banks fell, so must the world? That’s false. 3. Have we been hoodwinked by the Establishment? I suspect the rest of America has just directed billions of dollars to help New York. And not even all of New York. Not Wall Street– just the banks. 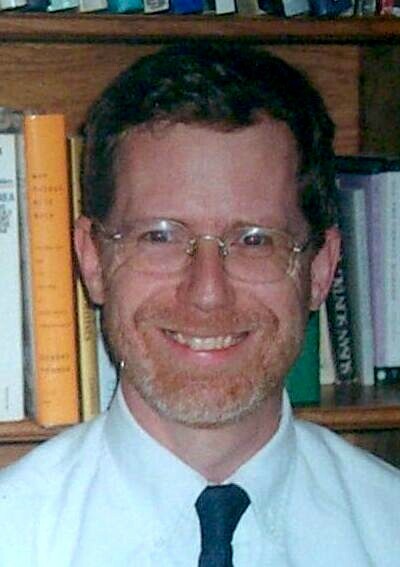 Professor Barro had a good WSJ op-ed recently on the historical evidence for the USA for fiscal policy. WW2 is the big example– maybe the only example of where people say it had an effect. He doesn’t think much of that as evidence. If WW2 is not a good example, then maybe there aren’t *any* good examples of the Keynesian effect. Data from the Ec. Rep. of the President is at http://www.gpoaccess.gov/eop/2009/B79.xls . The Deficit/GDP ratio rose to 5.9% in 1934 (first year of the data there), to 30.3% in 1943, to 4.2% in 1976, to 6% in 1983, to 4.7% in 1992, to 3.6% in 2004, and was estimated at 2.7% for 2008 (I suppose this estimate is from January 2008). A stimulus extra of $400 billion per year would add about 2.9% to the budget deficit for 2009. That would take it up to 2.7+2.9= 5.6% if we use the pre-recession estimate of tax intake and GDP for 2009. We’d reach the 1934 and 1983 levels of budget deficit. Is that enough to take us out of a recession? 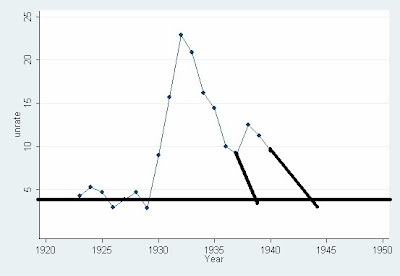 I’d always heard that the New Deal spending was *not* enough to have much of a Keynesian effect. In that case, the best the stimulus package could hope for would be to mildly helpful– it’s not big enough to get us out of a recession. But was the WW2 spending helpful? 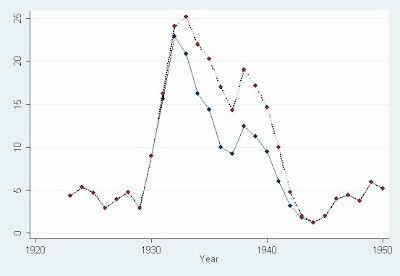 It was certainly big enough–30% of GDP in 1943. I thought I’d look at the WW2 experience in a very simple way. 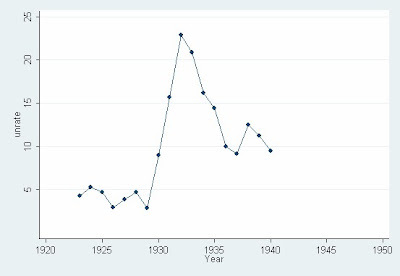 The first diagram shows the unemployment rate from 1923 to 1940. What would you expect to happen in the 1940s? Here’s what it looks like to me. The normal unemployment rate is around 4%. 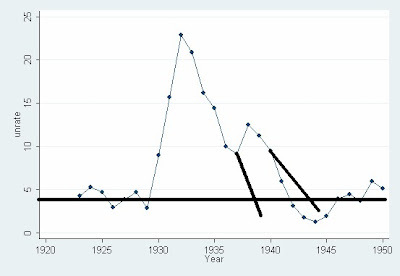 If the 1938 recession (was that the “Capital Strike”?) hadn’t hit, it would have been reached in 1939. WIthout WW2 it would have been reached in 1944. It is worth mentioning that there was a massive government jobs program in the 1930’s, which affected unemployment. Below I graph both the civilian unemployment rate that I used above and an adjusted, higher, rate which is (Unemployed people + people in emergency govt. jobs)/(labor force). The picture is similar. Rasmusen on World War II as a test of Keynesian stimulus and Robert Barro. The National Budget, Debt & Deficit . Graphs and numbers.